I haven’t done a Monday Miscellany in a little while, my schedule over the last month or so being a little disordered. I’m actually able not only to do a miscellany this week, but do it on the proper day (at least, it’s the proper day when I’m writing this; by the time most readers will see it, it will be Tuesday, but hey. I do my best.). 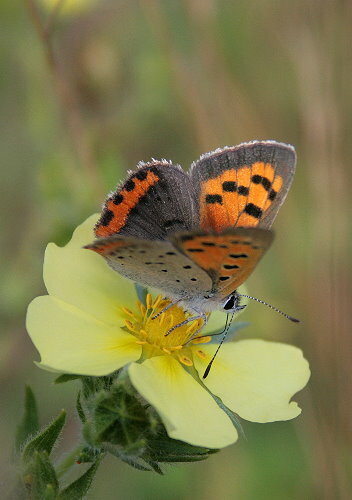 Today’s header image is of an American Copper, Lycaena phlaeas. With such extensive meadow habitat at our new home, I’ve been seeing quite a few species of butterfly that I hadn’t encountered before; this is one of them. It’s actually not an uncommon species, I just haven’t spent enough time in appropriate habitats. It’s an interesting species in that it’s got two very distinct populations, separated from each other by great distance. The eastern population ranges through much of the northeast from Nova Scotia to Missouri. The northwestern population is found mainly through the arctic, from Baffin Island to Alaska, and south through the Rocky Mountains as far as Wyoming. A few disjointed populations are also found in other alpine areas. It has been hypothesized that the eastern population was actually introduced, and only the northwestern population is native. 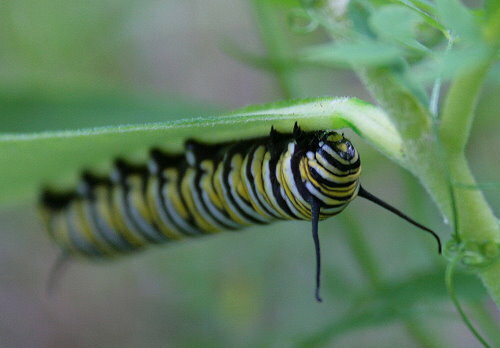 Here’s something else I’d never seen: a Monarch caterpillar. I’m not sure why these guys have eluded me, as there has always been milkweed around the areas I’ve frequented. When we moved in and saw the expanse of milkweed by the house, I figured it would be a Monarch butterfly haven. I expected to see dozens of Monarch caterpillars chowing down on the plants. I was therefore surprised to see very few adult butterflies, and no caterpillars at all, despite dedicated regular checks of the meadow. Dan located this one right at the edge of the pack as he was chaperoning Olly during the cat’s daily outdoor walk (which the cat has come to demand rather vociferously). He was thoughtful enough to come get me. The caterpillar was gone when I looked for him the next day. The rainy, cool weather that we had for all of June and July now seems to be a thing of the past. The last couple of weeks have been hot and humid. We have no air conditioning in the house, so to try to combat the heat of the afternoon we open all the windows wide at night and close them again when we get up in the morning. 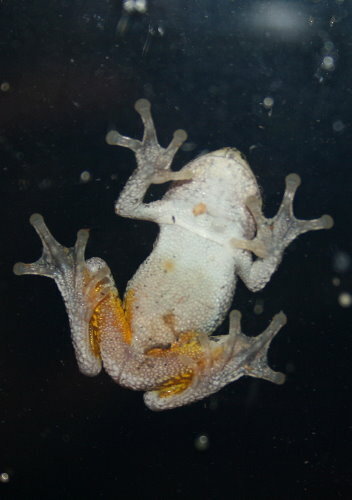 As I was opening the windows one evening, I discovered this little guy clinging to the outside of the window. It’s a Gray Treefrog, although you can’t see much of his upperside. The yellow of the inner thighs is diagnostic of this species, as are the thick toe-pads that he’s using to cling to the window. I’m not sure why he was on the window, except perhaps to eat the insects that were drawn to the light. I turned the lights off when I went to bed; he was gone in the morning when I got up. 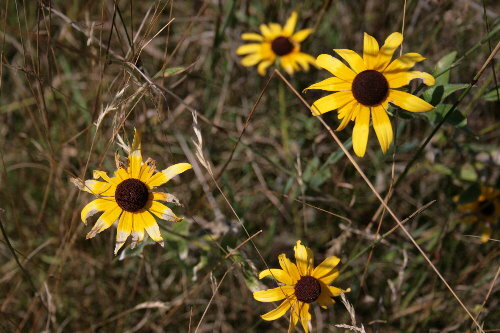 We’ve had Black-eyed Susans blooming all summer in our meadows. It’s funny that they’re so common here in eastern Ontario, where they were relatively scarce where I grew up in the Toronto area. I’ve enjoyed admiring them each time I go for a walk, and made an effort to capture them in the panorama I used in the new header image for the blog. This week I’ve noticed some are starting to fade. What interested me about this observation was the fact that the outer portion of the petals seemed to go first. Many flowers, including Black-eyed Susans, appear differently under UV light, and through eyes that can detect UV rays, such as those of insects. Most of the time the UV patterns aren’t obvious to our non-UV-detecting eyes. However, on these fading flowers you can see where the two areas of different UV reflectance are, with the central circle mostly intact, but the outer one well worn. Check out this photo over at Flickr for an example of how bees see Black-eyed Susans – the petals are actually bi-tone. 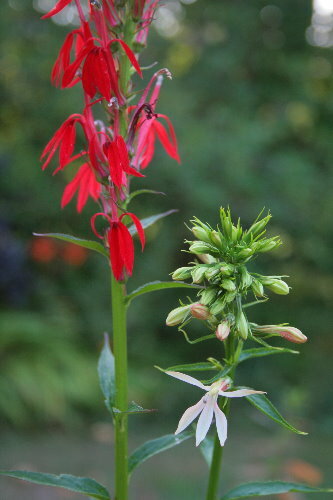 Back in the spring I bought myself a Cardinal Flower for my garden with a birthday gift certificate. They’re a native species usually associated with wet or damp areas. We had seen the occasional Cardinal Flower along the lakeshore near our previous house, and I’d become quite enamoured with them, so I snatched one up when I happened across them in a garden centre. I usually browse through the pots until I find one with multiple stems, if possible; the one I bought had four. I wasn’t expecting it to bloom this year, but to my surprise all four stems put up inflorescences. I guess all the rain we’ve had has really appealed to them. Three of the four stems were the gorgeous bright red that I had specifically bought them for, but when the fourth set of inflorescences began to open I was delighted to find that they were pinkish-white. Some research on the web suggests this is an uncommon, though not unusual, colour form. One website I found was selling the white form for twice the price of the usual red. Another website commented, with regards to the common name, “Flowers are very attractive to butterflies and hummingbirds, but not cardinals.” The “Cardinal” in the name, of course, refers to the colour, not the species it attracts. Alongside our driveway I have noticed a few of these plants. They grow with several broad leaves sprouting from the stem at the base, and a tall spike with small flowers up its entire length. I knew it was an orchid, but not what species; poking around online it appears it’s Helleborine, Epipactis helleborine. When we think orchid we tend to think of the flashy big-flowered things you can buy in pots in the grocery store. If we think of native orchids out in our woods, we usually think of ladyslippers. In actuality, though, there are dozens of native orchid species in North America. Ontario alone has more than 50 species of orchid growing wild. Many of them have smaller flowers and are less showy than their larger cousins the ladyslippers, but are nonetheless delightful. Helleborine is a non-native orchid. 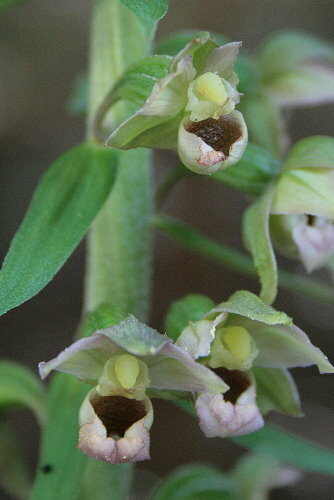 Its genus, Epipactis, is originally native to Europe, with no representatives native to North America. The first Helleborine was found in New York in 1879, likely spread from a parent plant planted outdoors somewhere some years earlier. While visiting my parents this weekend, my mom commented that she’d observed some black beetles on a few of her daylily plants. When I investigated the plants myself I discovered that not only were there beetles on her daylilies, but the dead flower heads were absolutely crawling with them. 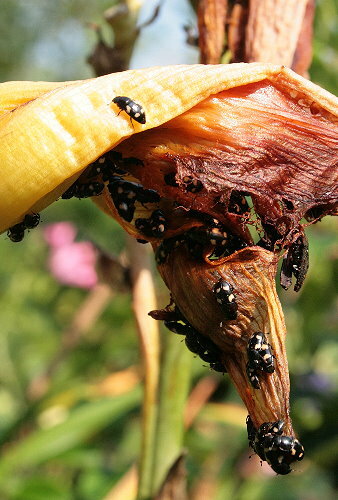 The collapsed petals were so filled with the beetles that they were physically moving. I had seen these beetles before, once: while camping at a state park in Minnesota. I had sat down to eat my lunch (a sandwich from Subway) at a picnic table, and was very rapidly assaulted by a barrage of little black beetles wanting to get in on the action. I ate quickly. The beetles are, appropriately, called “picnic beetles”, and belong to the genus Glischrochilus. They’re attracted to sap and decaying fruit. I presume these flowers would fall in the latter category; with the temperatures so high, and the sun beating down on them, the dead flowers smelled strongly of fermentation. These final beetles were found on some goldenrod in our meadows. I didn’t have to look hard to find them, though – both of these species appear to be particularly abundant right now. 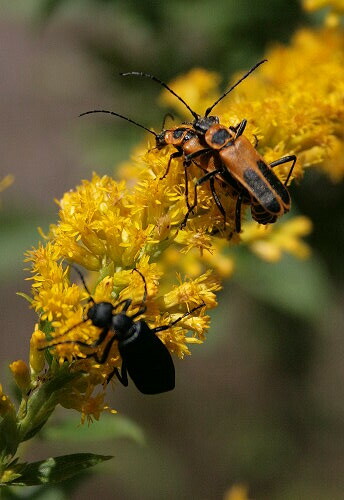 The orange ones are Pennsylvania Leatherwing, Chauliognathus pennsylvanicus, found commonly on goldenrod throughout the east. The members of this genus are all important in pollination and biological pest control, as many will eat aphids and other insects. The black one is Black Blister Beetle (say that five times fast! ), Epicauta pennsylvanica. It’s also frequently encountered on goldenrod in the autumn in eastern North America. Like all blister beetles, they exude chemicals that can burn and blister the skin. Apparently some species of Epicauta feed on grasses and crops as adults, and if baled with hay have been known to actually kill horses that ingest them. great shots! I love the look at “little things” and then see how great they are! Thanks! A whole new world opens up to you when you start peering closely at things. This is such an educational post! And the shot of the butterfly just takes my breath away….so lovely! Thanks, Kerri! I’m glad you enjoyed it. Lots of good stuff! Thanks for the virtual tour of your meadows and garden. Thanks, Jackie! Look forward to more in the future. Thanks for the tour. There is just SO MUCH out there! and every little thing has an interesting history. Thanks for pointing a few of them out. Glad you enjoyed it, Cheryl. It really is amazing just how much there is to see and learn about when you look a little closer. I love your frog photo! Now, that’s a view you don’t see very often. I was about to ask how you’d gotten it, but then you told me. Very cool. Thanks, Carolyn! I just couldn’t resist grabbing my camera when I saw him clinging to the window. Great shot of the frog! As Carolyn pointed out, it’s a view most never see. Thanks, Jason! There really is so much to learn about out there – even the common things that we walk by every day. Wow, Seabrooke – what a great bag of treats! Your first photo of the butterfly on the flower is beautiful. I love frogs – mine are calling out in my frog pond right now. Neat little guy with his big ol’ toes. And about the Cardinal Flower – I have checked with my favorite nurseries the last two summers, and they haven’t carried them. Then I just happened to spot them at a big box store. I chose 3 pots and planted them along the bank of my frog pond. They haven’t done nearly as well as the ones in your photo – but I suspect they don’t get enough light. I’m going to find the perfect spot – they are just lovely! Thanks, Amber! It’s funny how picky plants can be about their location. Sometimes moving them to a new spot in the garden can make all the difference. I’m a little surprised the one I have has done as well as it has – I knew it was a water’s-edge plant, but I put it in the middle of my dry garden anyway, and was pleasantly surprised that it put out flowers there, and in its first year.